Same sitting eight brocades qigong video as the DVD for much less. Stream or download each video lesson. Master Yang instructs and demonstrates "The Sitting Eight Pieces of Brocade", the most popular set of beginner-friendly Qigong healing exercises. This includes 20 minutes of follow-along exercise and then 40 minutes of detailed explanation of how and why the exercises work. These gentle breathing, stretching and strengthening movements improve the Qi (energy) and blood circulation in your body, stimulate your immune system, and make you feel great. Known in China as the Ba Duan Jin, The Eight Pieces of Brocade has been practiced for over 1,000 years. Also included are the "˜secret words' - poems that have preserved each exercise, which contain the key to each of these ancient medical qigong movements. 1. "Analysis" - A short demonstration of each qigong exercise with instructional voiceover to introduce each exercise. 2. "Demonstration" - A follow-along continuous demonstration section in which Dr. Yang performs each piece with multiple repetitions. 3. "Lecture" - A one-on-one class in which Dr. Yang instructs each exercise with more detail and qigong theory. The sitting eight brocades qigong set includes exercises to calm the mind, stretch your body, strengthen the teeth, improve digestion, heal the internal organs, boost your immunity, and much more. Each piece of the Brocades should be practiced by beginners 6 - 8 times to start. When you begin, only perform each exercise for the number of repetitions that feels comfortable. As your health improves, you may increase the number of repetitions, up to 12, 24, or even 32 times. This app gives you sample videos and offers an opportunity to get the full sitting qigong video at the lowest possible cost. 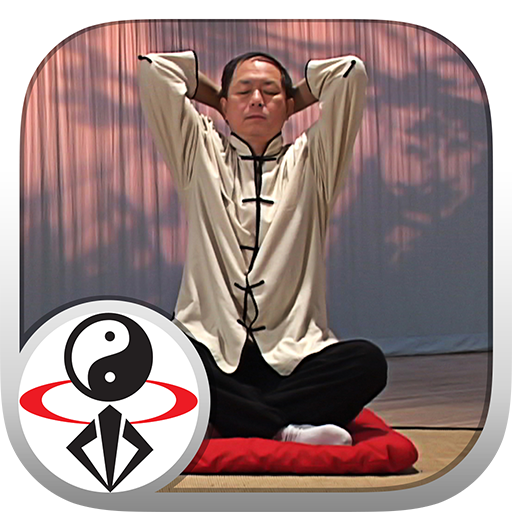 Now you can practice Master Yang's popular qigong exercises using your phone or tablet. This is a convenient training tool you can bring anywhere, to access this amazingly powerful exercise whenever it fits best into your day. Whether you are a beginner or a qigong master already, these amazing exercises offer the perfect combination of relaxation and full-body stretching exercise. You'll enjoy reduced stress, a stronger immune system, and a deeper awareness of your mind, body, and spirit. You will develop important skills for immediate stress-relief to relieve anxiety and/or post-traumatic stress disorder, or just relax, rejuvenate, and maintain a healthy baseline of a calm and balanced mind and nervous system. Qigong is a great way to charge of your health and offset depression. Qi-Gong means "energy-work". Qigong (chi kung) is the ancient art of building the body's Qi (energy) to a higher level and circulating it throughout the body for rejuvenation and health. Some Qigong is practiced sitting or standing still, while other Qigong can be a kind of moving meditation. This gentle stretching Qigong exercise is a highly effective way to enhance healing, raise up your spirit, and generally improve your quality of life.